I’d like to take a quick moment to wish everyone a Happy Memorial Day. I spent last night at a cookout at the house of one of my good friends, Brian – a Marine I met while studying abroad in Argentina. A house full of Marines and their families – talk about a perfect way to remind yourself what Memorial Day is all about. For my senior thesis, I had the pleasure of spending a year following the lives of the Cashion Family. Joe Cashion is a Sergeant in the Army and volunteered for a six-month deployment to Afghanistan. I followed the family before, during and after Joe’s deployment. I learned so much from them and will always treasure the way they opened their lives to me. In honor of Memorial Day, I wanted to re-post the multimedia project I created. When I first came across the Lexicon of Sustainability project, my first thought was “Damn this is so cool! I wish I had thought of this!”. This project combines some of my biggest passions in life: photography, travel and food. I love that the photographers are using their skills to educate themselves and the public on the complicated terms used in the modern food system. I agree with their philosophy that “people can’t be expected to live more sustainable lives if they don’t even know the most basic terms and principles that define sustainability”. More information is never, ever a bad thing – although you can choose to ignore it at times (like when a funnel cake at the State Fair seems like the best idea in the world). Access to education, learning, knowledge is how change and improvement are born and I love that these photographers have found a creative way to do that. 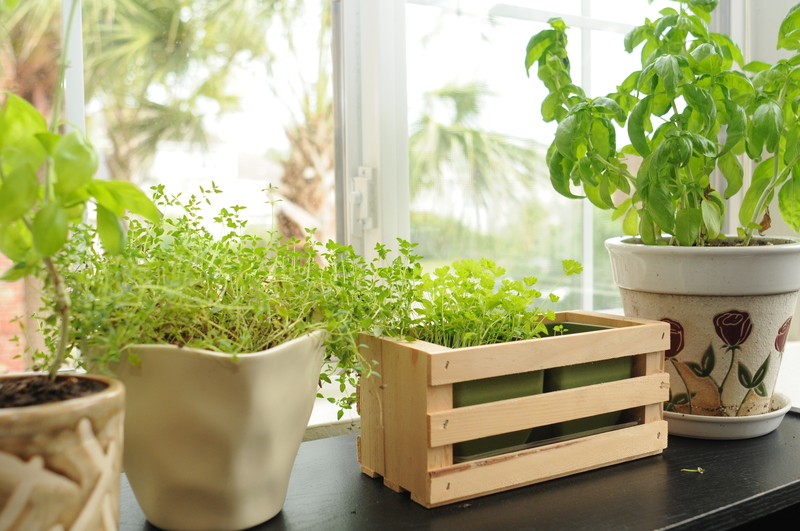 My lovely little herb garden, on a bookcase in my apartment. This is a subject that I have become more and more passionate about over that last few years. In many ways, it feels very natural. As a Midwestern girl, I come from a long line of farmers and “sustainable”, “local”, “real” foods are what my grandparents (and parents) grew up eating. They just called it “dinner” or “food”. I grew up eating from gardens and homemade canned items – not because of a “food philosophy” but because my brothers and I thought it was pretty cool that you could plant a carrot seed and a few months later have a carrot (and because my grandmothers lovingly kept our pantry full of home-canned tomatoes, yummm). The point of these ramblings are to say that I think the Lexicon of Sustainability is a wonderful project. I love that they’re educating the public. I love that they’re supporting small farmers. And I love that they’re using their photography to improve the world (in their own way). Below are a couple videos from the Lexicon of Sustainability project. Enjoy. What do you think of the project? What words would you like to see added? *To be clear, I didn’t write these blogs so I don’t necessarily agree with 100% of the content. But, I think they’re all doing good things by encouraging people to know where their food comes from. Some of you may have wondered what happened to me after my Argentina Adventures. Well, I cried a few days over Malbec and Tango withdrawal, then I spent a couple of months of quality time with my family in Ohio (which was pretty great). And this past December, I packed my things and moved to Charleston, South Carolina to start my life in the “real world”. For the past couple of years, I’ve worked as an intern with Microburst Learning, an e-learning company based in South Carolina, and after my graduation in December, I started with them as a full-time employee. My job duties have increased in both quantity and responsibility level and I’ve spent the past five months adjusting to those changes. 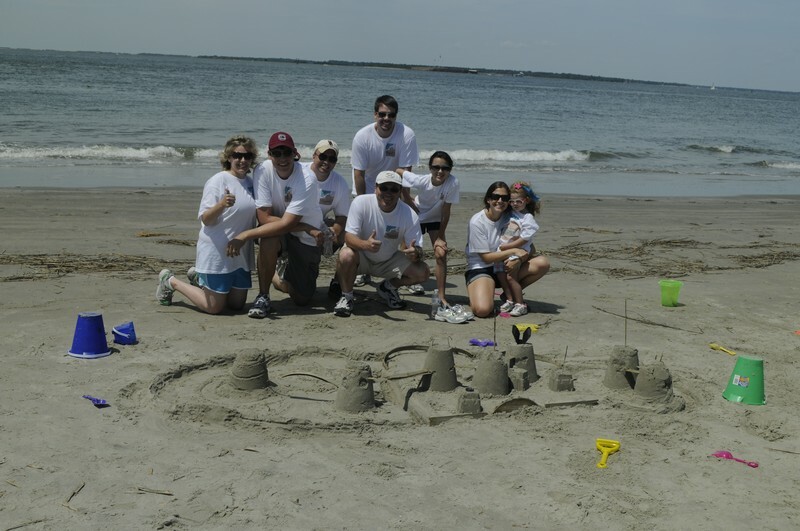 One-half of Team Microburst Learning (we split into two groups for the walk) with our fabulous sand castle. My mom is a nurse and has worked with Cystic Fibrosis patients throughout her career. We also have a family history of the disease so my brothers and I grew up with a broad understanding of CF. And, I remember going to functions and camps run by the Cystic Fibrosis Foundation as a child. So, when I was looking for a group to volunteer with when I moved to Charleston, the CF Foundation came to mind. Every year CFF does a walk called Great Strides to raise money for CF research. 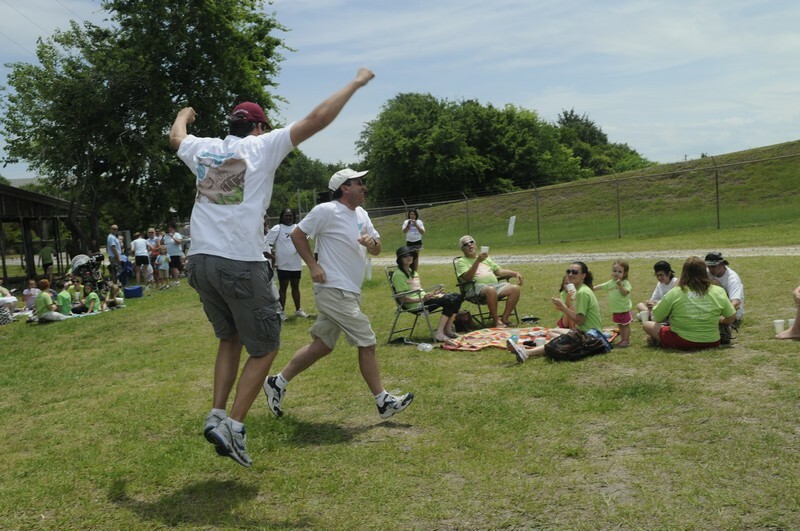 Luckily, I convinced my coworkers to start a corporate team with me and we just participated in the walk a week ago. So far, our team has raised $1000! And, just as importantly, we had an awesome time at the walk! Enjoying some downtown with the daughters of two of my co-workers. 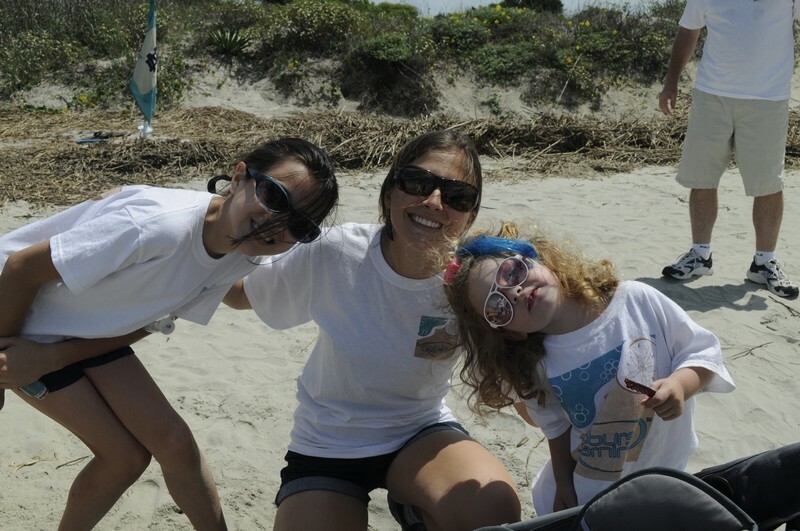 We opted to participate in the “Challenge” Course which involved ten challenges such as sand darts, charades and sand castle building. All the activities were really fun and I’m proud to say that our team WON the Challenge Course! 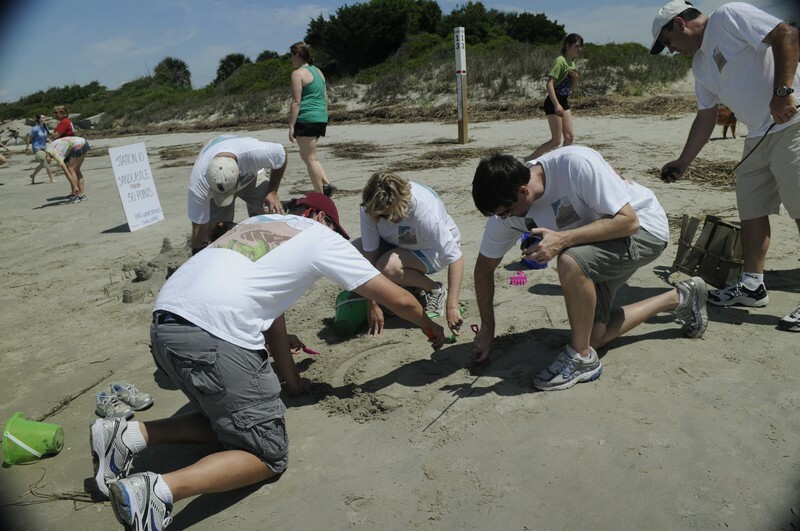 Team Microburst Learning working tirelessly on our sand castle. Doing this challenge with so many creative people was a lot of fun! The husbands of two of my co-workers enthusiastically accept our Challenge Course award. We topped off the day with some good ol’ Southern BBQ and ice cream. Yum, yum! Moving forward, I plan to continue working with the Cystic Fibrosis Foundation (we’re in the middle of planning a bike race!). Have you been to any fun charity events lately? A couple of weeks ago, I had the wonderful opportunity to photograph a hair drive at the Bishop England High School on Daniel’s Island, South Carolina. 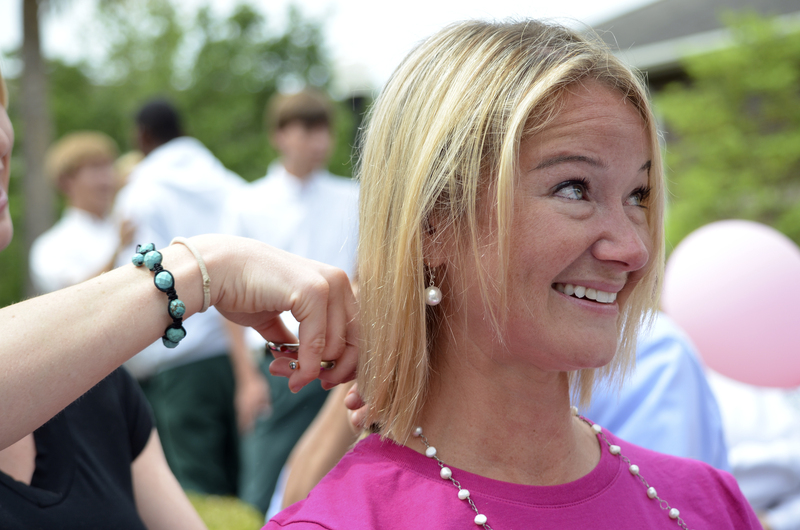 Christine Ronco, a teacher at Bishop England, organized the drive for Locks of Love, a non-profit organization that provides hairpieces to children suffering from long-term medial hair loss. McKenzi Mazur, a sophomore at Bishop England High School, nervously waits while her hair is cut. Ronco told the students about the drive last fall, giving the girls almost an entire school year to grow their locks. McKenzi Mazur, an energetic sophomore, said she was “really nervous” but was glad that she decided to donate. 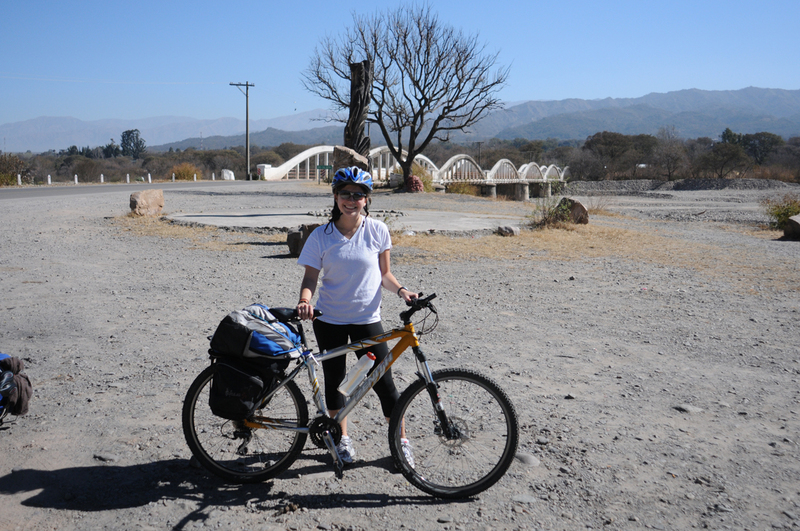 “It’s the least I could do – I wanted to do it for kids who are sick”. Christine Ronco, the teacher who organized the hair drive, was one of two faculty members who participated in the drive. 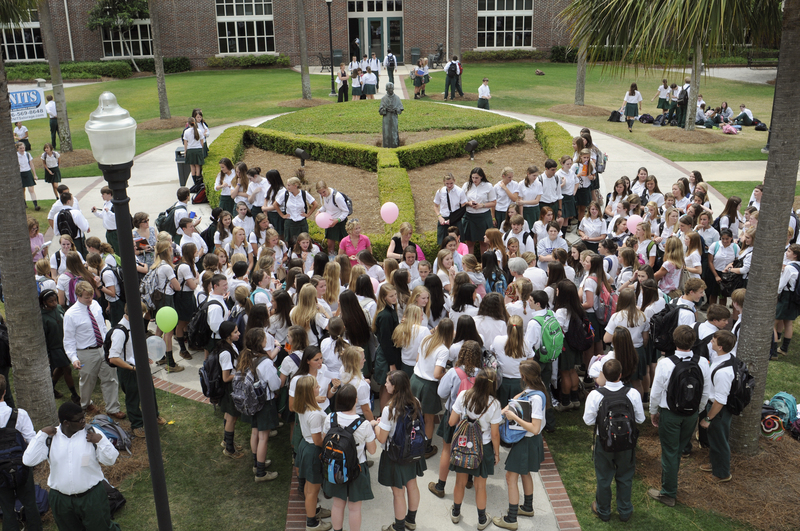 A crowd of students gathered in the courtyard at Bishop England High School to watch the Hair Drive during their lunch hour. Prior to the drive, Ronco had a list of 30 girls who were going to donate. By the end of the lunch hour, over 75 girls had donated up to a foot of their hair! The youngest donor, Phoebe Govett, 7, was one of the calmest in the face of the shears. 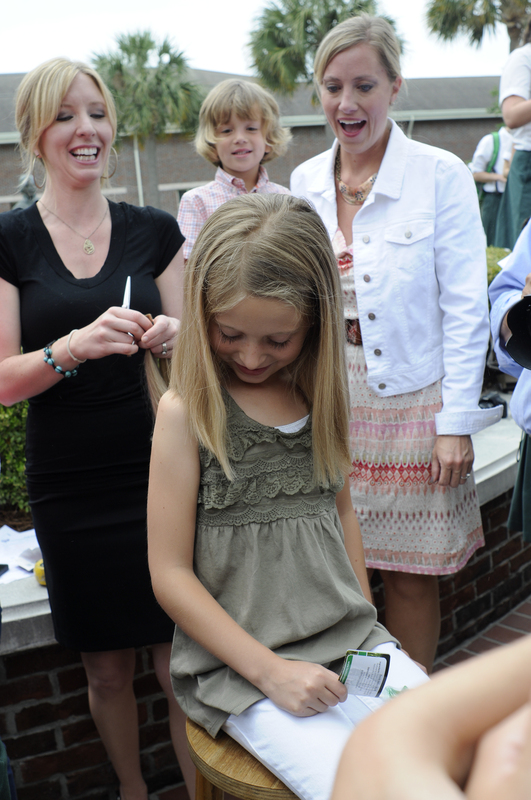 Her mother, Ashley Govett, said that she had been wanting to donate her hair for a long time. When she heard about the school drive from a friend, she asked if she could bring Phoebe along. “I wanted to donate to a kid who doesn’t have any hair,” Phoebe told me. Phoebe Govett, 7, admires her new, shorter hair. The drive was a huge success and I really enjoyed spending the afternoon at the event. 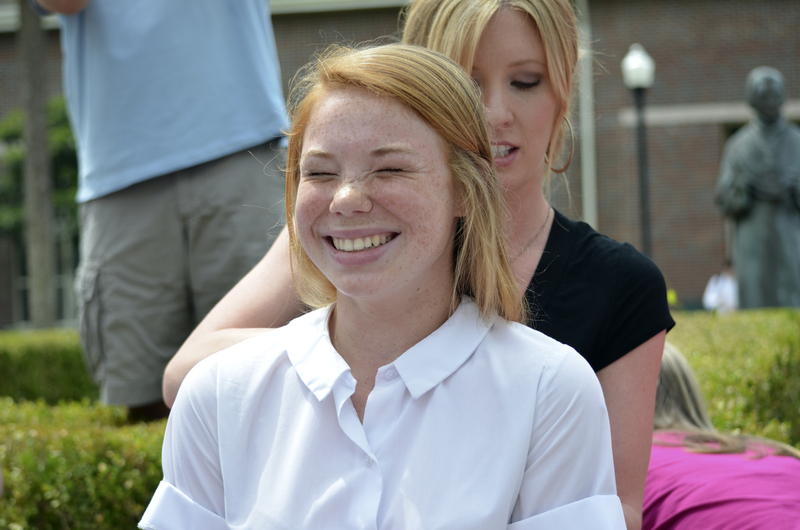 Sidney Copleston, a student at Bishop England High School, can’t hide her fear while her long locks are cut. “Oh my gosh! It’s all gone!” she exclaimed afterwards. I haven’t been doing a very good job posting since I’ve returned stateside, but I thought I’d post this 2011 Year in Review (via WordPress). Thank you to everyone who read, commented on and shared my blog this year. I promise to get some new photos posted soon! The concert hall at the Sydney Opera House holds 2,700 people. This blog was viewed about 9,900 times in 2011. If it were a concert at Sydney Opera House, it would take about 4 sold-out performances for that many people to see it. The below photo is one of my journal two months ago. I believe I was feeling frustrated after yet another cold shower (due to a broken gas line that stayed broken for quite awhile) and felt the need to vent. 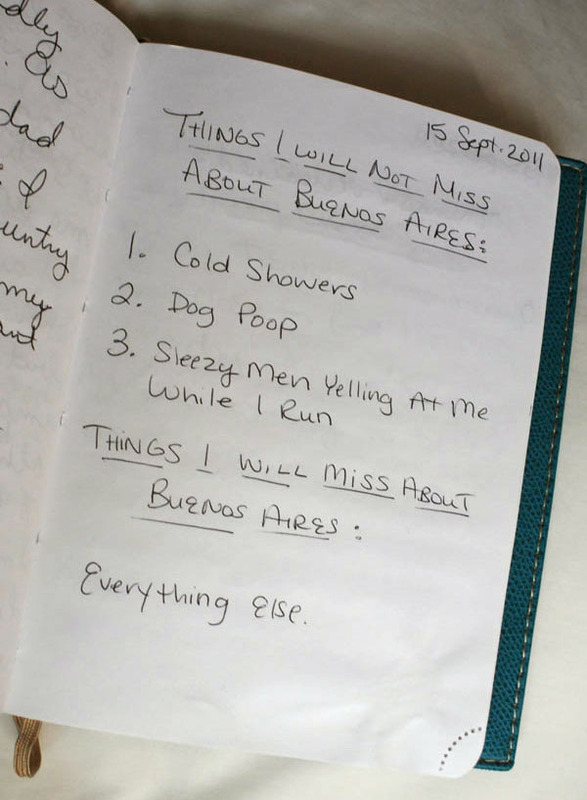 Looking at this entry inspired me to write about what I will miss when I leave Buenos Aires this Saturday night. While I still stick with the statement that I will miss “everything,” I’ll try to be a bit more specific here. Not only will I miss the perks, like a home cooked dinner every night or a maid to clean my room once a week, but I’ll miss the extended family I’ve gained. Carmen always made me feel so welcome and included on any family activities. As a result, I’ve had the good fortune to spend time with her brother and his family as well as both of her sons. Living with a host family was the thing I was most nervous about but it turned out to be a very positive experience and I feel extremely lucky to have been placed in this house. 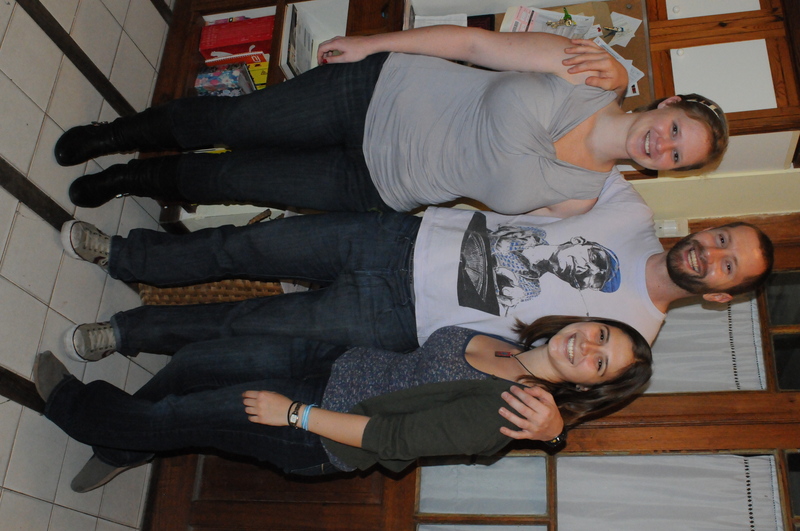 My roommate, Stephanie, my host brother, Nico and I. 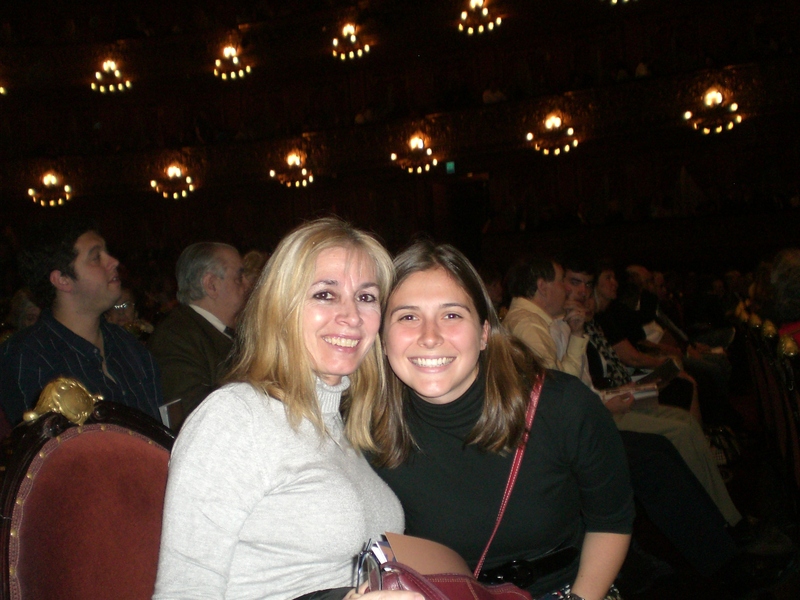 My host mom, Carmen, and I at the Teatro Colon. I’ve met some incredible people here from all walks of life and it will be hard to say goodbye to them. When I moved from Ohio to South Carolina for college, I met many people from various backgrounds and with viewpoints different than my own. That was at times challenging but also very rewarding. 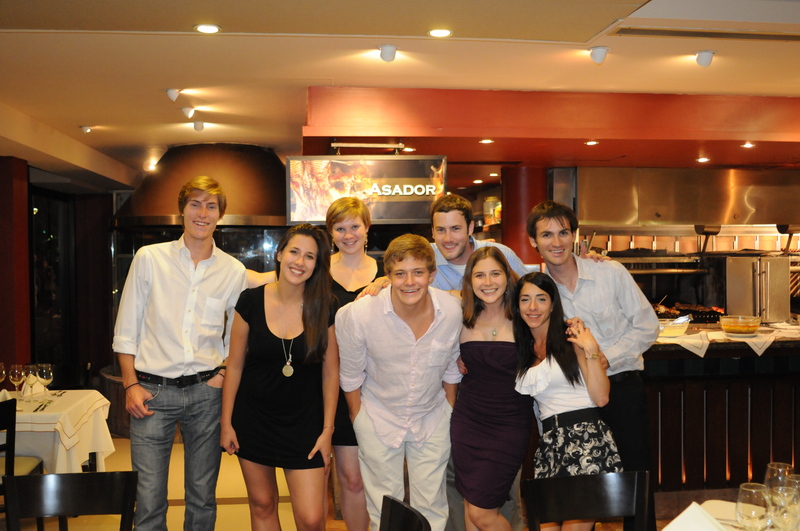 Coming to Buenos Aires, I had a similar experience but with even newer backgrounds and viewpoints. Knowing and loving friends with different ways of seeing the world is always a positive experience and I will miss the strange cast of characters that have become my friends here. 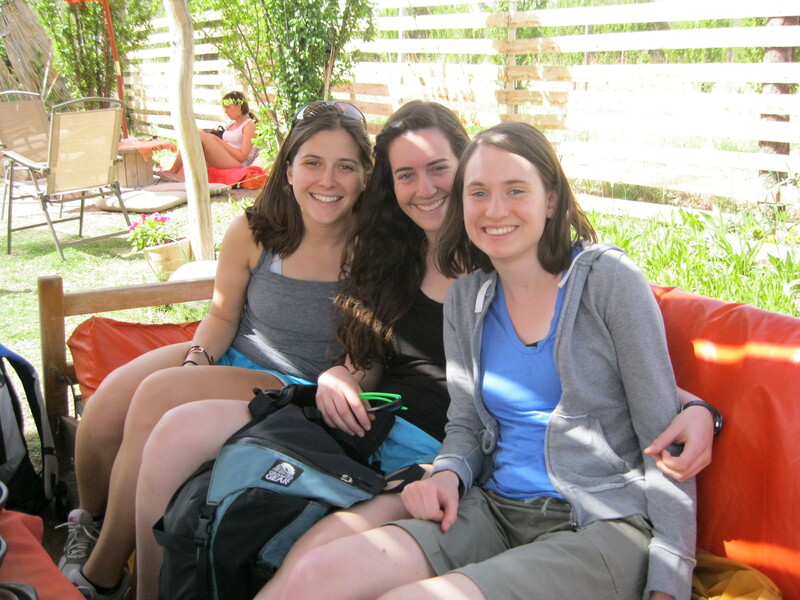 With my friends Kehala and Phoebe in Mendoza. The ASA (my program) gang. Really, it’s indescribable. A creamy, gelato-esqe texture, but rich like ice cream. Just one more cone! 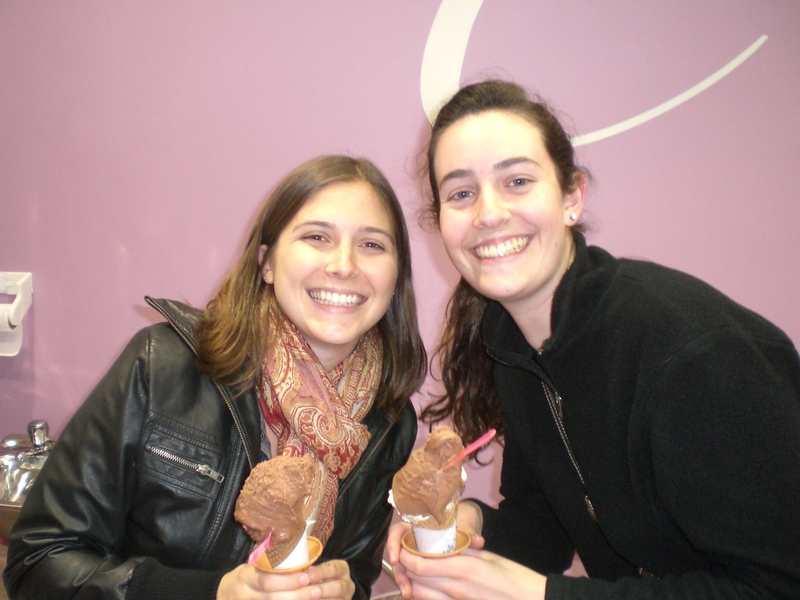 My friend Kehala and I enjoying some yummy Chocolate Mousse ice cream. 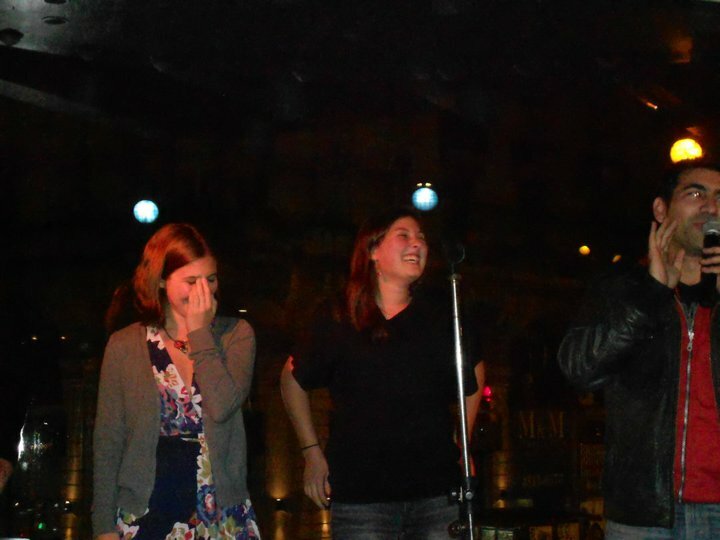 It sounds obvious, but I will really miss having constant opportunities to work on my Spanish skills. I love walking outside and being surrounded by Spanish (something that was a bit terrifying when I first arrived). I love the way Argentines speak Spanish. They speak with so much passion and exaggeration that it’s almost theatrical. Answering trivia questions (in Spanish) during my first month here. One thing this experience has taught me is that traveling is not nearly as hard as we pretend it is. There were multiple times here that I decided to take a weekend trip somewhere and simply went. It didn’t take months of planning, it often didn’t take a lot of money. I will miss that spontaneous thinking, but I hope I can bring it back with me. There are so many places to see in the U.S., why not go for a weekend?